Perry Sisk, Senior Director of Information Technology Systems & Support (second from left) represented Saint Mary's at the annual CAUBO awards ceremony in Ottawa. 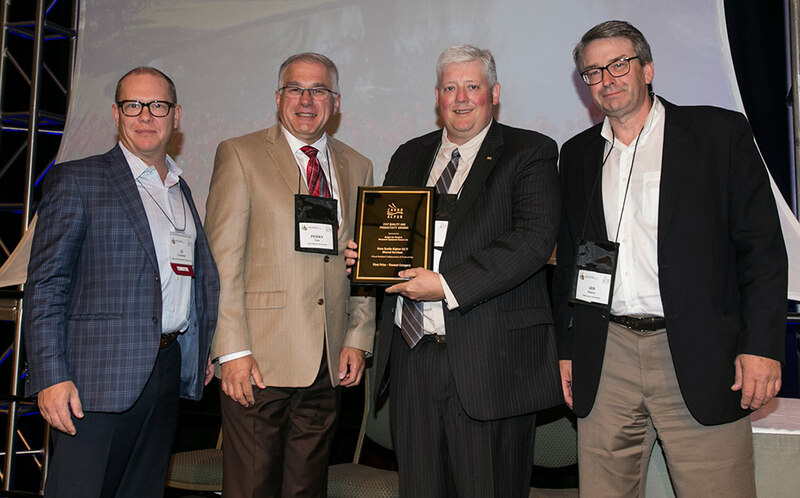 The Canadian Association of University Business Officers (CAUBO), has awarded Saint Mary’s University and its partner institutions first prize in the category of Cloud Enabled Collaboration & Productivity at its annual conference in Ottawa. Nova Scotia’s 11 post-secondary institutions make up the Nova Scotia Higher Ed IT Shared Services Program. Members are using the Office365 communication and collaboration platform to provide each institution with industry-leading cloud-based technology at lower costs. A single procurement contract with Microsoft and a shared services project management office allows schools to share implementation plans, policies and best practices, change management and support services, as well as technical migrations and collaborative training. Vice-Presidents Finance and Administration, along with IT leaders from each institution, collaboratively manage the shared IT services. The Office365 platform has enhanced both mobility and security, while reducing costs. Moving internal email systems and file storage to the cloud resulted in annual savings of $20,000 to $200,000 per institution for maintenance, and $100,000 system-wide in software licensing fees. In 2015/16, eight shared service projects were completed at a combined saving of nearly $350,000. Divested of servers and responsibility for upgrading applications and storage, IT organizations can focus on more value-added activities, including ongoing transformation of service delivery, technology, and collaboration. In the future, the standardized platform could also facilitate sharing networks across multiple institutions. Having leveraged the transferability of core infrastructure and IT systems among its institutions, Nova Scotia has created a model for adoption in other jurisdictions.